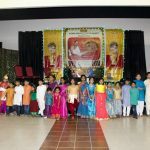 By the immense grace of Sri Swamiji, Dallas Madura Utsav Fall 2012 saw its first temple Satsang, and Lord Sri Krishna made the lecture on Srimad Bhagavatam happen at His Guruvayurappan temple at Farmers Branch, Texas on November 21, 2012. The evening commenced with the Ayyappa mandala pooja followed by rendition of Sri Swamiji’s kirtans. 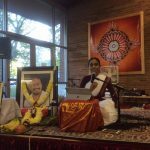 Sriramji from Houston briefly shared Sri Swamiji’s experiences [anubhava] and how he adores Lord Guruvayurappan. 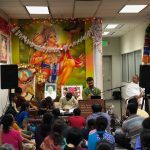 Following the kirtans, the devotees were treated with impromptu Bhagavata parayanam by Sanjev Kalyan ji who recited the third chapter from tenth canto that stayed in everyone’s memory! After brief introduction and welcome to Shri Ramanujamji by The Guruvayurappan Temple management, the discourse started that saw Nama Smaranam, Keerthanam, Parayanam and Pravachanam as a step by step progression into Bhagavata Dharma, just like the way Sri Swamiji had laid it to be. Shri Ramanujamji started by describing the lord as Sanketha Bhashi, one who speaks by grace, sitting in the Satsang and his sheer grace that has led everyone to this path of Bhagavatha Dharma. He elaborated that the main precept of Srimad Bhagavatam was to contemplate and meditate on the Supreme truth, “Sathyam Param Dheemahi”. This was beautifully elucidated as – Sath means Truth, Guru also connotes Truth. Thus, Sathguru means the Supreme Truth. Yam, being the Moola mantra of Vaayu, and Appan in Malayalam means Supreme Being, hence Guru-vayur-appan is the Supreme truth and there is no equivalent to Him (Nirastha). Shri Ramanujamji recollected and vividly described the miraculous incident that led to Sri Swamiji’s kirtan“Bhagavatha Priya Namo Namo”, on the banks of Narayana Saras that had been rendered earlier in the evening. He elaborated about Srimad Bhagavatam as one that has everything in it and hence all the Mahans have written their commentaries about it and proved their love for it. The discourse was briefly paused for Guruvayurappan Arathi during which time all devotees chanted the Mahamantra. Guruvayurappan’s beauty could be described as Jyothi swaroopam with all the lamps lit around him only to be dimmed by His light! After the Arathi, the discourse continued with Shri Ramanujamji explaining what to look for when reciting Srimad Bhagavatam. He encouraged eveyone to look for some specific person, a disciple of Sage Suka or if Rajan is mentioned. In Srimad Bhagavatham second chapter of first canto has everything to make lives clear. There is only love and happiness in Srimad Bhagavatam and nothing else, no one is bad, no act is bad. Kamsa depicted BhayaBhakthi and Gopi’s had Prema Bhakthi and everything is shed under positive light. The lord gives us innumerable chances to please him so that he can shower his grace on everyone and that he is patiently waiting. The lord only wants single-minded devotion towards him and nothing else. He even shows the path with baby steps of listening to his divine glories and chanting his divine names. Sri Ramanujamji exhorted the devotees to give Srimad Bhagavatam a chance and that it will surely lead one to happiness. He quoted Chaitanya Mahaprabhu and Sage Suka regarding the greatness of Nama Kirtan and in order to attain Lord Krishna, one should listen to his name, just one name – Eka Nama in the form of Shravanm, Kirtanam and Dhyanam. Lord Sri Krishna is “Mano-hara”, one who steals the mind, which is like trash, and gives us punya in return. Eleventh Canto emphasizes this, by doing charitable deeds one silences the mind and offers it to Lord Krishna, and the easiest way to do this is through Shravanam, being one with Lord Krishna. 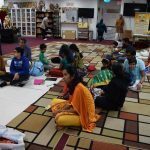 The devotees present were given the invaluable opportunity of Shravanam through Shri Ramanujamji’s discourse and what more can a Bhagavata ask for? The delectable evening concluded by delicious Mahaprasad, courtesy of the Temple. 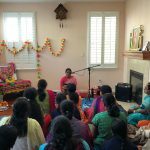 The evening then continued into the late hours of the night at the residence of Sri Maya Kootanji and Mrs.Jayanthi ji where a few devotees shared their experiences about Sri Swamiji. This was followed by Shri Ramanujamji’s Madurasmriti, a candid recollection of his experiences with Sri Swamiji. The devotees present were fortunate to see and experience Sri Swamiji in Shri Ramanujamji’s words, and the transformation that had taken place in him, and in turn felt transformed! 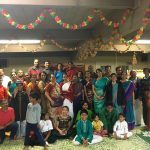 This continued into the wee hours of the morning which happened to be Thanksgiving Day, and each one present there had more than one reason to be thankful and for the wonderful Satsang Family, who meant more than one’s family! !